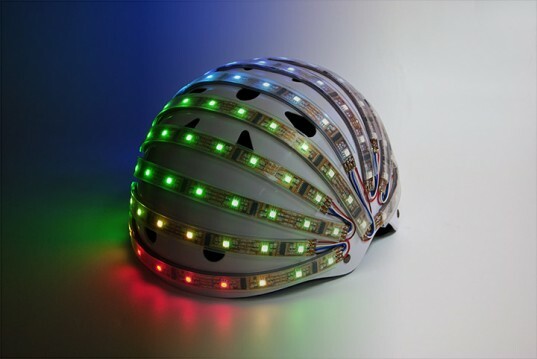 I was finishing up a run yesterday evening when I noticed a man cycling down the street with an LED light system inside the casing of his bike helmet. What a cool idea! I was starting to formulate how I could make it myself when I came across an article on the lovely AdaFruit – a website that helps me with my Arduino projects from time to time (and is responsible for the code for the RGB LED light I made). I wonder if I could make it myself? I already have some of the parts (I think). 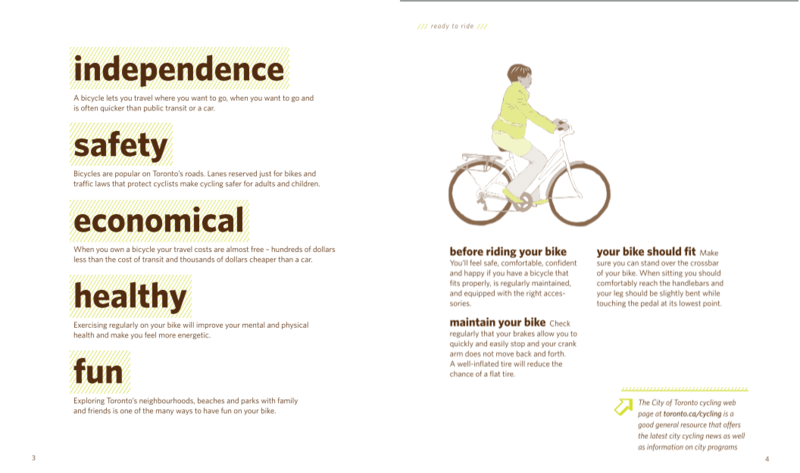 I also wanted to brush up on some facts/rules/laws/tips about biking in the city, since I'm the newest of newbies at it. As I mentioned yesterday, I went for my first bike ride on Sunday to get a feel for it. 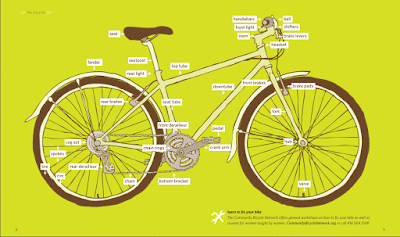 But I feel like practicing and picking it up from observation may not be the safest route, so I found a really cool Toronto Cyclist Handbook on Cycle TO's website. It's amazing. It's designed so nicely and has such excellent information. It's seriously a joy to read and I am learning so much. And just look at this double-page spread on parts of a bike. I'm dying. As per the two lines in the bottom right corner (click to enlarge), I am confused as to why women would want a bicycle repair course just for us. I'm cool with a co-ed class..? It's not like it's an exercise class or something, in which I suppose some females might feel self-conscious about their bodies, but this is just learning how to repair a bike. 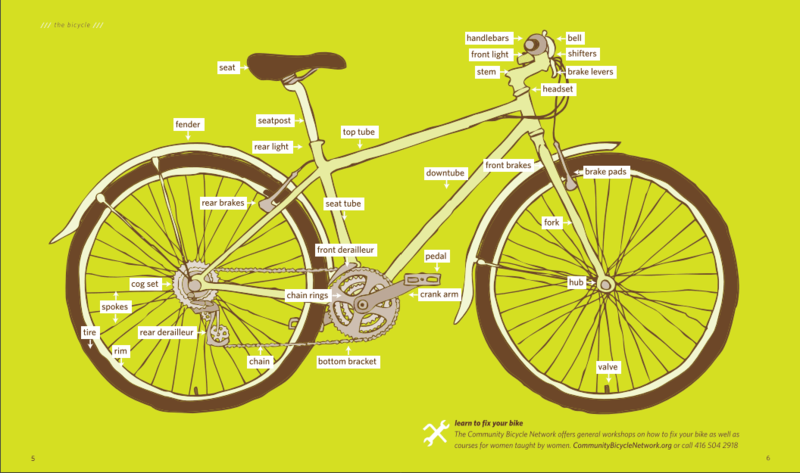 I hate to wonder if the idea is a little sexist, assuming that the author believes that women feel bike repair is a men's job and would be ashamed for men to see that they can complete a task without men. Maybe I'm making a leap here. But I find it curious. 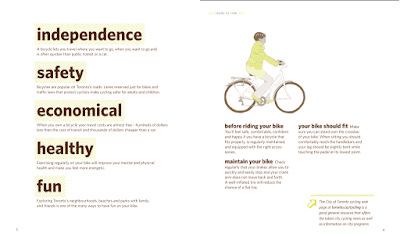 The handbook was designed by Simon Farla, who does a lot of volunteer work for the Toronto Cyclist, and even designed (and then later received) their Volunteer Awards. Pretty nice! And lastly, I must report that I am the luckiest girl in the world because the cycle pot is being stirred in my neighborhood! The city is seriously considering installing bike lanes on both sides of Bloor street between Shaw and Avenue roads. Considering I live at Bloor and Shaw, that's pretty darn lucky. I would be so happy if this became a thing because it would connect my route directly from home to work in one neat, straight line, not to mention remove all the parked cars from the road so I can see the beautiful landscape that Toronto's Marquee Street (quoting Mike Layton) has to offer. Such a life to lead. P.s. I must admit that I have not yet cycled my inaugural bike ride to work, because I am waiting for it to not rain during the morning commute. Tomorrow may be that day!